Patton's low cost EtherBITS™ Model 2232 Single-Port RS-232 lets you monitor, control, and collect data from any async RS-232 device over any IP network. Ethernet has far outgrown the confines of the office network. 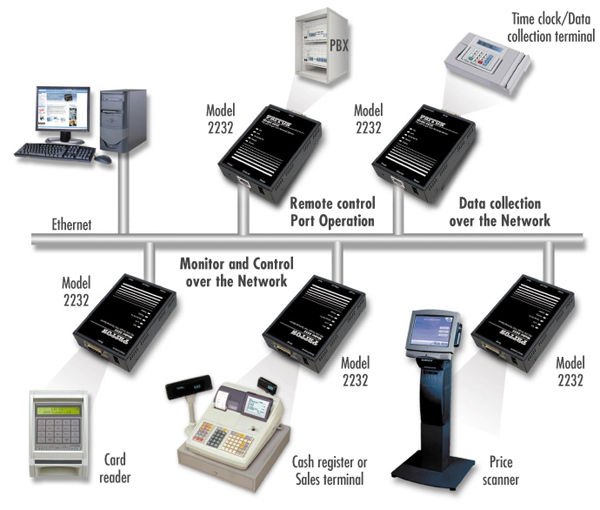 From factories and farms to railways and retail shops, credit bureaus, banks—even medical and dental offices—anywhere serial devices are found—the EtherBITS Model 2232 offers network managers the lowest-cost solution for making the transition from legacy serial infrastructure to the age of IP. The EtherBITS Model 2232 provides both a serial RS-232 port (male or female/DB-9 or DB25) and a 10Base-T Ethernet port to link any RS-232 serial device to the Ethernet LAN at user-selectable data rates from 1200 bps to 115.2 kbps. The Model 2232 encapsulates asynchronous serial data into IP packets for transport through the network via TCP or TELNET. The Model 2232 delivers a transparent end-to-end connection to your PC or network management host using any user-defined IP address and TCP port number. For greater flexibility, a built-in DHCP client can dynamically obtain an IP address from a master server anywhere on the network. With the included COM Port Redirector software you can use the existing COM/TTY on your PC, thus avoiding the hassle and expense obtaining an additional software license. Connect serial devices and terminals to Ethernet quickly and easily with Patton’s low-cost EtherBITS Model 2232 Single-Port Terminal Server. The Patton EtherBITS Model 2232 lets you leverage the power and flexibility of Ethernet for low-cost, hassle-free device networking. The Model 2232 Single-Port Device Server is used to connect various RS-232 serial devices to the local area network through their serial control ports. The 2232 enables monitoring, control, and data collection from this equipment by remote computers located anywhere on the local or wide area network. COM Port redirector is provided for users who choose to use their existing serial communication application programs. Using the redirector software provided on the Patton Model 2232 allows existing COM/TTY-based software to be preserved, thus no additional investment is required on additional software. The Patton Model 2232 can be used for serial data tunneling when used in pairs. When operating in pairs, the 2232s will simulate a direct serial link between two serial devices over an Ethernet connection. Using IP allows the user to extend serial connections from across the building to across the world using the World Wide Web.